Depending on your pre-k facility’s exterior, you may want to think about investing in hanging fence easels by Manta-Ray. They would be ideal for outdoor/indoor art activities. As the name suggests, the easels are designed to be attached to a chain-link fence. However, they also come equipped with rubber bumpers that help to make them suitable for tabletop use as well. The company manufactures a single fence easel and a double fence easel. The double easel is 47.5 inches wide whereas the single is 23.5 inches wide. Both of the easels are 22.5 inches tall and come outfitted with strong paper clamps. Thus, you won’t need to worry about the children’s artwork being blown all over the play area on windy days. Sturdy, easy to clean, roomy supply closets are also important to have available. If your pre-k facility is equipped with multiple classrooms, Jonti-Craft’s Mobile Classroom Mega Supply Cabinet would be an excellent choice. It is 24 inches deep, 46 inches high and 45 inches wide. As such, you should be able to store enough art materials inside of the cabinet for two, modest size pre-k classes. Pre-k teachers will also undoubtedly love the adjustable shelves, locking doors and locking casters. Educators unconcerned about locking up art supplies after class may prefer the Whitney Brothers’ Rolling Art Center instead. Shaped like a cube, it features open shelving and pockets. Storage area depths range from 5 inches to 23.7 inches. 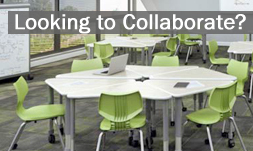 Want a closer look at additional art room furniture that would perfect for pre-k use? Contact Worthington Direct at 1-800-599-6636. We stock an assortment of art room essentials including tables, chairs, light boxes, mobile paper racks and drying racks. < Office Chairs: A Second Bed?